Write it in your heart that every day of this new year is the best day. This year I’ve not made any resolutions as I forget about them even before the 15th of January. Desserts, chocolates, good fried food, chaats still tempt me to no end. Perhaps I will try and take baby steps or make small mindful changes every day. However, it can only work if I continue with the change and not forget about it after a day. Lets see how it goes. But changes I do want. I want to go into 2017 loving myself more. I want to stop pleasing others. I want to think about me and my hubby more. I want to do what I feel I should. I don’t want others telling me what I should be doing. I am old enough to know what is right and what is wrong. For me that’s going to be like a major makeover. No seriously, after certain events that took place last year, I want to break the shackles of pleasing everyone. As hubby dear often reminds me that I should follow my heart. It is also important to thank our past years and learn from it. Its the past that has allowed us to move to the new year. Its also a time to thank God for all that we have, good health, home, family and friends. So here’s wishing you all a year which will bring you good health, peace, happiness, more family time, prosperity, success in all you want to achieve, new friends and continued friendship. Our 1st Monday of 2017 theme for #FoodieMonday#Bloghop is New Year. This is the 73rd theme. We had to prepare anything that we think is fit to welcome the New year into our lives. New beginnings mean celebrating with something sweet. However, after the wedding, Christmas, hubby’s birthday celebrations I really didn’t want to add more sugar into our bodies. I decided to make something that is naturally sweet and healthy – a fruit salad. You may think what’s so unique about a fruit salad, but for me it is. I don’t get dragon fruit in Mombasa so I decided to make a fruit salad using it. Saw the dragon fruits at a local veggie shop in HSR Layout, Bangalore and decided that I must use it for my next post. The other fruits I used are in season here and am enjoying them every day. So here’s my naturally sweet post to celebrate the New Year. To prepare the orange reduction, mix orange juice and cornflour in a thick bottomed pan. Put the pan over medium heat and let the juice become hot. When it begins to simmer, reduce the heat. Let it simmer for 7-10minutes till it becomes a little thick. Scoop out the flesh from the dragon fruit. Cut the grapes into half. Hull the strawberries and cut into half or thick slices. Mix the fruits and mint leaves together in a serving bowl. Pour the orange reduction over the fruit salad and serve. Use any fruit of your choice. Make it colourful so that it is appealing and kids will want to reach out for it. Can serve the fruit salad with some ice cream or drizzle fresh cream over it. Use basil leaves instead of mint. You are right Mayuri, after so many celebrations, this one is the best start to your new year. Ideal way to start the new year. Love the riot of colours.Nice presentation . What a beautiful fruit salad, I have yet to try dragon fruit. It looks so pretty. Orange reduction is something new for me .. never tried it. I will definitely make this fruit salad. Now is the right time to enjoy the various salads..
Nayna, basically it doesn't have much taste on its own. I tried it first time at Marriot Juhu. Now its available in most big cities in India so when I found some in Bangalore, had to make the healthy salad. Shobha, try the reduction… its goes well with fruit salads, to pour over plain cakes, to pour over vanilla ice cream or waffles, pancakes. You can make it with any fresh fruit juice. The salad looks so refreshing and inviting di ! 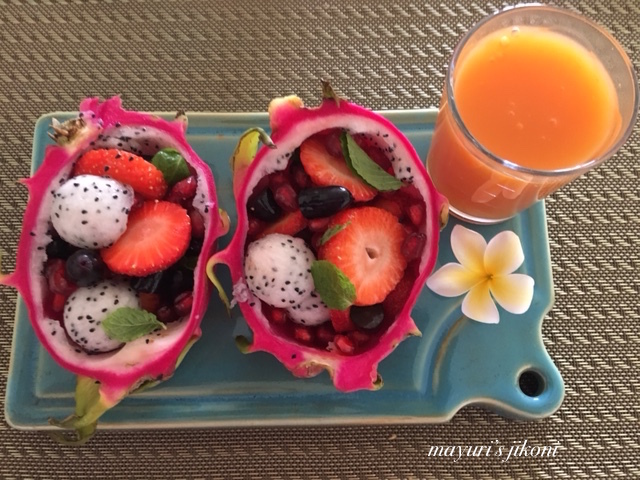 Dragon fruit was the most loved fruit during our stay in Malaysia ..such a perfect way to begin the new year ! Thank you Poonam, I too loved that fruit and ate it everyday during our stay in Bali.